Solea's decor dazzles. The interior is a captivating blend of antique stained glass windows, mosaic tile pillars, wrought iron chandeliers, richly colored walls and a splash of Latin American art and music, creating a chic atmosphere for a romantic dinner or celebration. 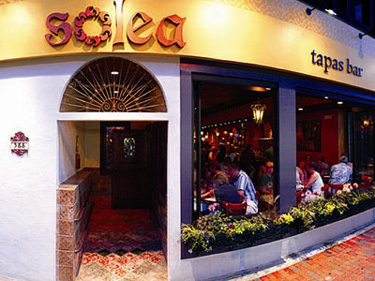 Owners Carlos Reverendo and Fernando Leon (of Tapeo on Newbury Street) opened Solea, on Moody Street in Waltham, in November 2001. It has since become the glamorous place to be in the western suburbs. With the focus on tapas - small appetizers drawing from Spanish, Portuguese and Latin American roots - Solea also offers main courses and sumptuous desserts. The wine list complements the menu with selections from Spain, Portugal, Chile and Argentina. Enjoy one of our Latino inspired signature cocktails or a glass of sangria while sitting at the original wine crate and tile bar or a late night snack in our open air cafe or lounge. Separate dining areas are available for private parties and business events.